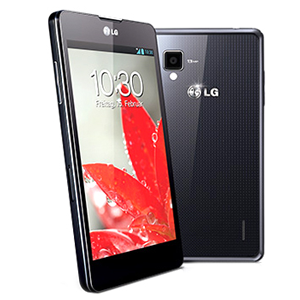 The LG Optimus G is LG's late 2012 flagship phone. Powered by the top-of-the-line quad-core Qualcomm Snapdragon S4 Pro processor, the device is certainly no slouch. The speedy processor is backed by 2 GB of RAM, 32 GB of ROM, a 4.7" "True HD-IPS+" panel, LTE connectivity, a 2100 mAh battery, and an 8 or 13 MP camera (depending on region). The device ships with Ice Cream Sandwich, but is slated to receive an update to Jelly Bean.